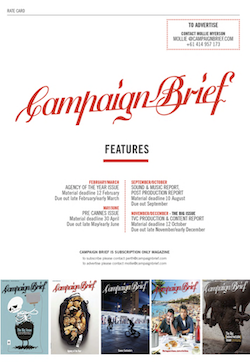 campaignbrief.com has become the advertising industry must visit site for all the latest in news and new campaigns with just about everyone in the industry logging on at least once a day. The CB Australian website receives over 188,000 visits per month internationally, over 323,000 page views. 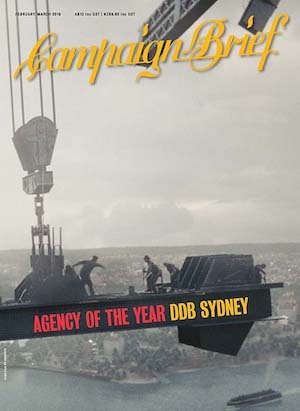 It’s the place to reach creative decision makers in Australia and expats throughout the world. The CB New Zealand website receives over 25,000 visits per month and over 42,000 page views. If you want to make your presence felt 24/7, now is the time to consider a value for money advertising campaign on the CB Australian Blog or NZ Blog. 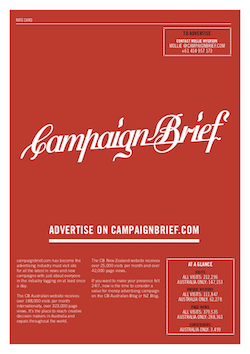 Contact mollie@campaignbrief.com or phone +61 414 957 173 to discuss your advertising requirements.